Koei once again raises the torch to burn the sky to the blood red colour of grand battles. Keep your friends close, but your enemies closer as the wisdom of the Five Rings is put to the historical battle test. 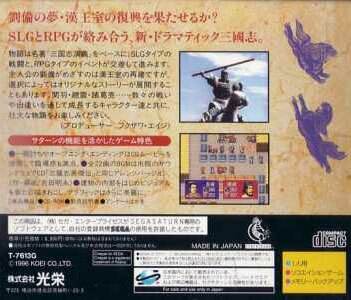 Koei has made it's war chest trading historical battle games based on ancient Chinese history. The nation has been divided into three kingdoms. You must unite the country or be destroyed by the prevailing anarchy. Also known as Sangokushi Eiketsuden. Brand new. Disk has come loose inside case.